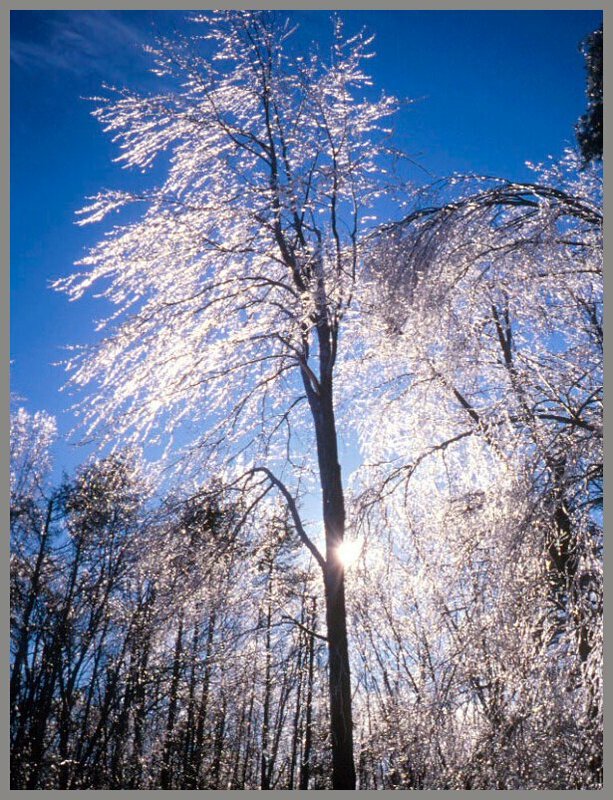 Ice – Injury - In forests, ice-injured trees add much needed carbon as cellulose for soil organisms. Hurricanes such as Hugo in the USA are much the same. Forest practices during the last several decades have removed so much cellulose that it is not difficult to believe soil organisms are starving. WARNING: There are no data to show that wound dressings prevent or stall decay. Wound Dressing and Heartrot are twins. When a tree is wounded, you should not treat only the wound but the entire tree. Trying to grow trees in sick soils is the same as telling a person you have beautiful teeth but your gums must go. See "Humic Acids & Humus." Click here for some pictures. With trees of the cities, in cold climates, winter ice injury can cause serious injuries. The same three part program given for hurricane injury in cities should be done for ice-injured trees of the cities. Trees are often wounded by agents other than humans in cities. Many trees in south Florida were injured severely by hurricane Andrew several years ago. After storm injury, work must be done first to reduce the risk of fractures that could cause problems for property and people. Next, the trees should be pruned for health. This means cutting off torn roots and removing long, injured branches to avoid sprouting that could lead to fractures. Note: I.e., pruning woody roots with a sharp tool - flat like the end of a straw beyond the damaged area - they do not have branch collars. Click here for picture. Prune the branches without injuring the branch collar or leaving stubs on the stem. Remember! There are many benefits of CWD for a forest.